Best Cheap Inflatable Hot Tub – Affordable Luxury! When it comes to relaxing in a hot tub – everybody loves it. But does it really mean that I have to spend thousands of dollars on a built-in hot tub and hundreds on installation? Definitely no! These days, high quality and durable inflatable hot tubs can be made for a very attractive price. 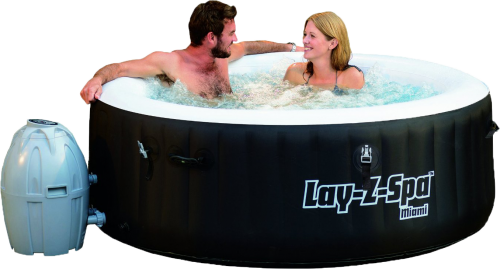 Take a look at these cheap inflatable hot tubs! Extremely popular and really cheap hot tub from a well-known brand Intex. It’s not just a simple inflatable pool, it features a hard water treatment system, advanced heating system and water bubbles of course. It seats up to four people and has a water capacity of 210 gallons. The included water heater can heat the water to up to 104 Degrees. There’s also a surface chlorine dispenser included. What about insulation under the hot tub? Intex included a thermal ground cloth to take care of it. And what more? It’s one of the most affordable inflatable hot tubs on the market right now! High-quality hot tub for up to four people featuring rapid heating and water filtration system. How do I change the water temperature or turn the bubbles on and off? It’s very simple. SaluSpa Miami uses an easy-to-use digital control panel. The hot tub is made of a high-quality material called TriTech and is suitable for both indoor and outdoor use. To avoid thermal losses, bestway included a cover which rapidly reduces electric consumption when the hot tub is not in use. Setup is very easy, just follow step by step instructions provided on the DVD. A cheap inflatable hot tub with built-in color changing led lights! It is designed to fit 4-6 people, but in fact, you would have a hard time squeezing six adults inside. 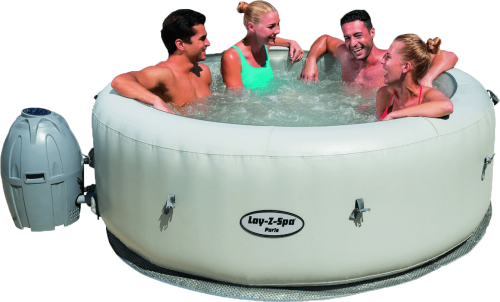 SaluSpa Paris can be easily installed without any special tools, as is standard in the inflatable hot tubs industry. Water capacity is 250 gallons. What about the heater? Well, just plug it into a common electrical socket, and you are good to go. Expect about 2-3 degrees Fahrenheit per hour temperature rise. 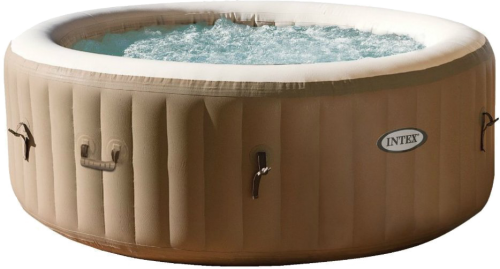 Don’t forget to check out our best inflatable hot tub top list, some of the hot tubs there might cost a little more than the ones listed on this page, but they are worth checking out! Imagine if you decide to get a built-in hot tub. It will cost you thousands of dollars in installation costs + costs of plumbing and electrical work. Built-in hot tub price can easily get to 10,000$. Then there are standalone acrylic hot tubs, these are definitely more affordable than built in, but they still cost thousands. That’s what cheap inflatable hot tubs are for. In a few hundred bucks, you get a heater unit and an inflatable spa (Which is much more rigid than you would expect from an inflatable. You can easily sit on the walls and it will support your weight easily without deforming). And what’s the most awesome part? You don’t need a plumber or an electrician. You can set it up yourself easily! These hot tubs run from an ordinary 110v socket and are filled using a water hose. It can’t get easier than this! Repair costs are another part where cheap hot tubs win. You can easily get an inflatable hot tub for 350$, that might not be enough to cover a one repair of a built-in spa. If you are careful about inflatable hot tubs, they will serve you for a long time. Of course, don’t bring a sharp object with you into the hot tub. I don’t know of anyone going into a hot tub with a knife anyway :). What if a leak occurs? Well, just patch it up! Take a look at our leak repair guide. You would be amazed how luxurious these blow-up hot tubs are. The two main drawbacks are the size and lack of water jets on cheap inflatable hot tubs. While most of them have air jets (which actually some people prefer), some of them have real water jets just like their expensive built-in counterparts. The biggest cheap inflatable hot tubs are for six people at most. And that’s with a lot of leg touching :D.
On ig checked reviews said all was good but now can’t even find the website! Just wondering if u have heard anything about fraud?? Hi Natasha! Where did you order it from? 55$ sounds unrealistically low. The best Christmas deals were at least 200 USD (at least on Amazon), and I doubt you would find any better than that. I’m sorry about that. I ordered the spa tub from this web site and have had no response from them been 3months the number they gave me was #7817.could you please let me know what happened to my order and money. Hey Barbara! I’m pretty sure you mean some other website. Do you mean Amazon? We are a review website, we try to bring you the most precise, honest and unbiased reviews of hot tubs, but we don’t directly sell any.